Last week a few of our team members had the opportunity to visit this year’s Spring Fair at the NEC in Birmingham. The Spring Fair happens every year and is a collation of both interior design, party planning, technology, fashion and gifts, from multimillion pound companies to small businesses it has something for every business. The brilliant thing about this show is that it gives you the opportunity to not only see the products but to sample them yourself, giving you a great idea about how the product will benefit both your company and your customers. We spent the day walking around some great exhibitions and getting some inspiration for this season’s colours and textures. 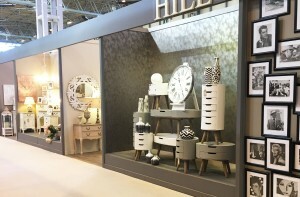 It was immediately clear from stepping in to the home exhibition that neutrals were the must have tones. Everywhere you looked there were hints of grey, beige, brown and creams, with grey being the dominant colour. However once we started weaving from stall to stall more and more tones and colours starting to appear, there were striking metallic colours, chromes and coppers and bright yellows and blues, all colours together satisfy any style need, from subtle hues to bold statements. Patterns were also a dominant feature throughout the exhibitions, from cushions to throws and the furniture itself, this season you can make really make a statement! The patterns we loved were geometric designs and stripes; these patterns work with all of this seasons colours and are a great way to accent any feature in a room. Have you been inspired by this seasons colours? Take a look at our Tessere range, these fabrics are brilliantly basic and have every shade to compliment this seasons must have colours. The pastels will make any room light and airy and will look great in the spring time, offering clean and soft tones, these colours reflect pantones on trend colour palette perfectly! The Tessere range also has a great selection of bright and bolder shades, adding great depth to this collection and making it one to match any of this seasons trends. The bold yellows in this range mirror a lot of the colours found in these exhibitions and will brighten up any room. Looking for calming neutrals? Our Tetris fabric is the ideal range for subtle tones and muted colours, this fabric has a wave texture to it, and with smooth lines running through the fabric it adds a hint of details to a flat surface.